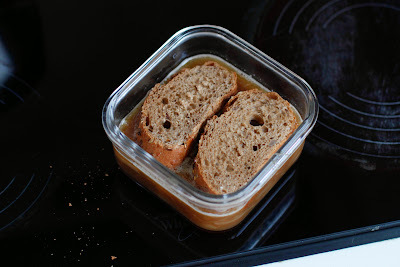 If chicken stock is like Eddy Murphy (versatile, well-liked by everyone, and the most popular of stocks), then beef stock is like Charlie Murphy. It's not made as frequently, it's underrated, and if used in the right way, it can be better than chicken stock. 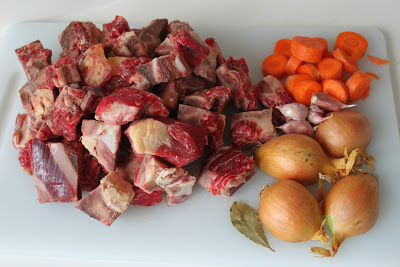 It takes a bit of time to make the beef stock, but overall it requires very little active cooking time. I suggest that people try to make stock one time to see if they're willing to go through the effort to make it from scratch. And while you are at it, you may as well make a really big batch and freeze the extra for other uses! 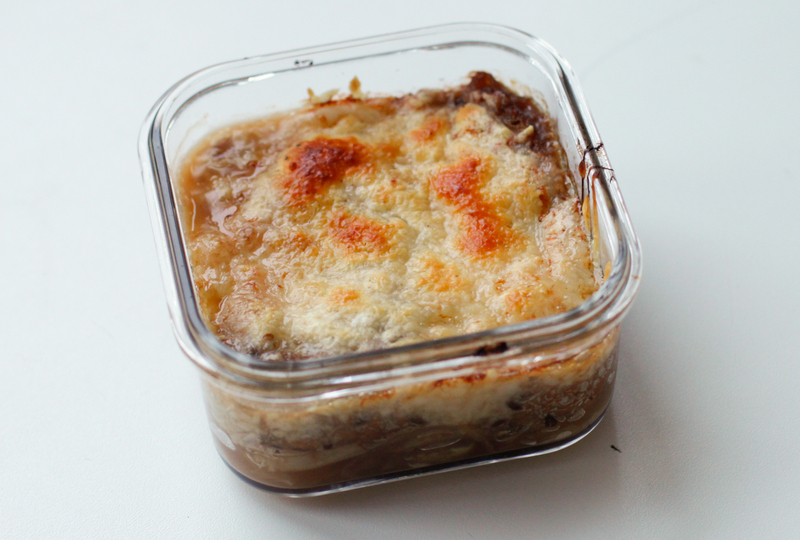 One of the ultimate uses for beef stock is a classic French Onion Soup. Using homemade stock will put your soup miles ahead of one using canned broth. Because you're using such a nice beef stock, you can simplify the recipe and it will still knock socks off. Slice 2 onions in 1/2 (you can leave the skins on as long as they aren't dirty), slice a carrot, and grab a few cloves of garlic. 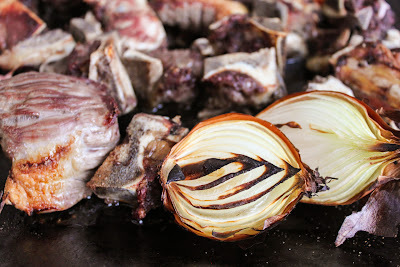 Toss them on a tray with your beef bones and put them into a 400F / 200C oven for 20-30 minutes until they are caramelized. This will deepen the flavor of the stock. 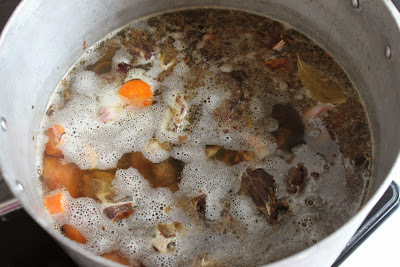 Add the roasted bones, the bay leaf, and veggies to a stock pot. I like to pour some water onto my cooking tray and scrape up all of the good bits of beef flavor stuck to the tray. Pour this into your stock pot. Fill the pot with water until it covers the bones, bring the whole thing to a fast boil, and skim off any foam or impurities that float to the top with a spoon. 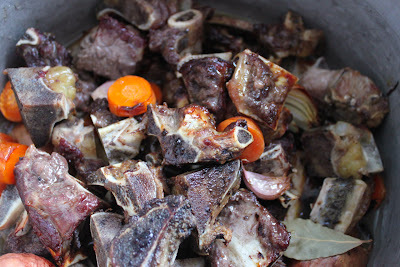 After your bones have given up all of their flavor, grab them out of your pot with tongs and throw them away. Strain the stock through a fine-mesh strainer (I never use cheesecloth, but you certainly can if you want). 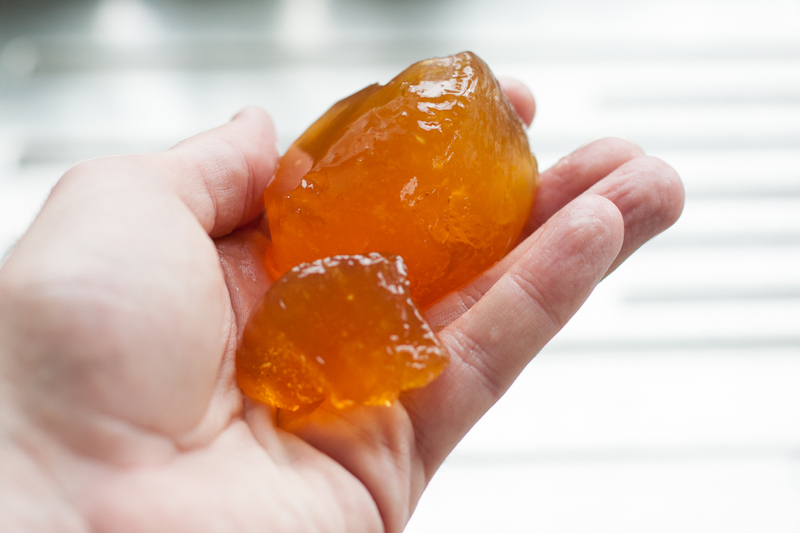 You can continue to reduce the newly-strained stock if you want to have the flavor more concentrated. You can store it in multiple ways: reduced heavily and frozen in ice cube trays for sauces, in jars in your freezer (easier for soups), or in large gallon freezer bags so they lay flat in the freezer. As long as you don't burn the liquid by reducing it too much, you can always add water to dilute it for a soup. 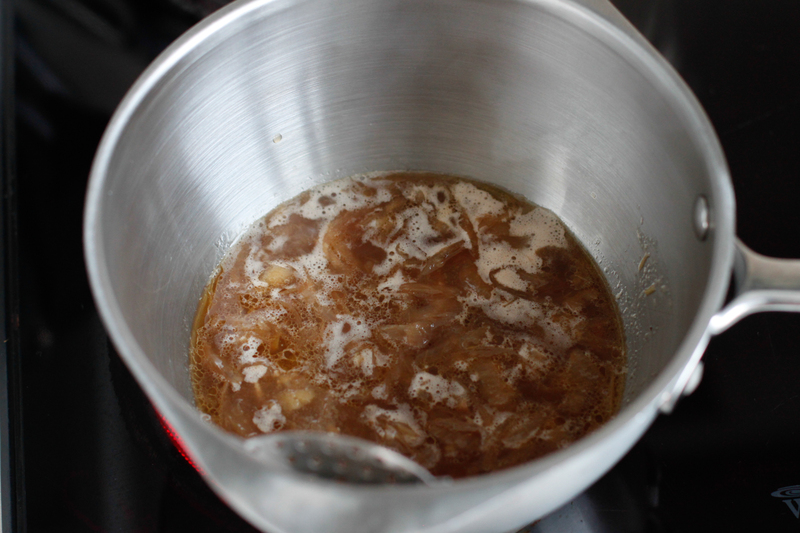 If you reduce it a lot, it will be super gelatinous like the below chicken stock. 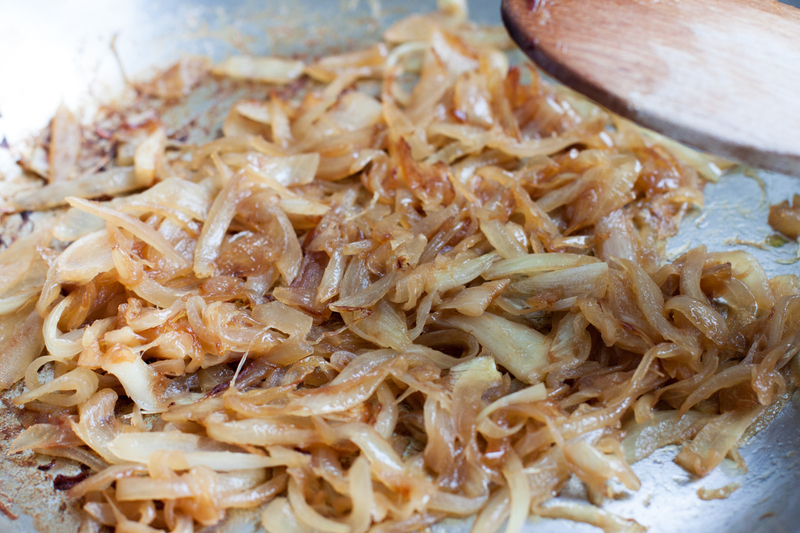 This stuff will add a ton of body and flavor to your sauces. 3.5 lbs or 1.5 kg beef bones (with some meat on them) - this cost me $8. I read through a lot of recipes online - most list over 15 ingredients for a classic French Onion Soup. If you make your beef stock from scratch, the only thing I think you need is a small kick of cognac and port to give a twang to the sweet and meaty flavor of the soup. Properly caramelizing onions takes about 45 minutes. Yes, I know this seems like a long time, but it's worth every minute. 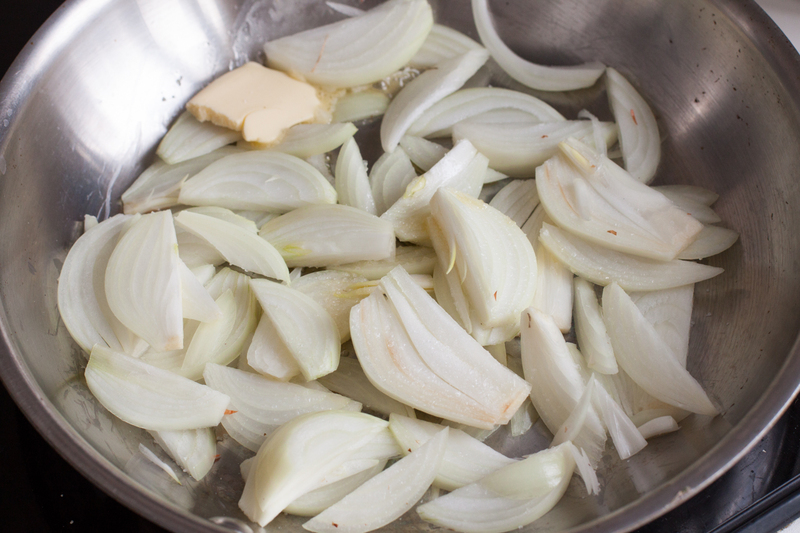 Put your butter and olive oil into a stock pot over medium-low heat. Slice your 6 large yellow onions into moons and add them to the stock pot. Cook them lightly and slowly until they are dark and brown (but not burnt). If they start browning before they have softened, you can add a few T of water and scrape up the brown bits on the bottom. Keep adding splashes of water until you achieve your desired color. Next, add in your beef stock and warm it through. Add a splash of cognac and port to your soup and taste. The alcohol will chill out after about 5 minutes, but take it easy in the beginning. While the pot is warming up, slice your crusty bread and toast it until it's light brown. Pour the hot soup into a bowl or ramekin and top with the crusty bread. And then cover it with a nice melty cheese. 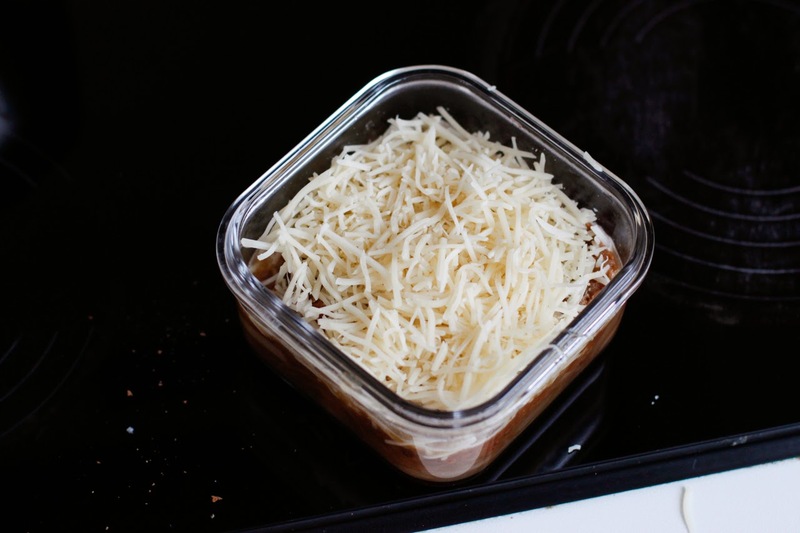 Toss it under the broiler until the cheese is melted! 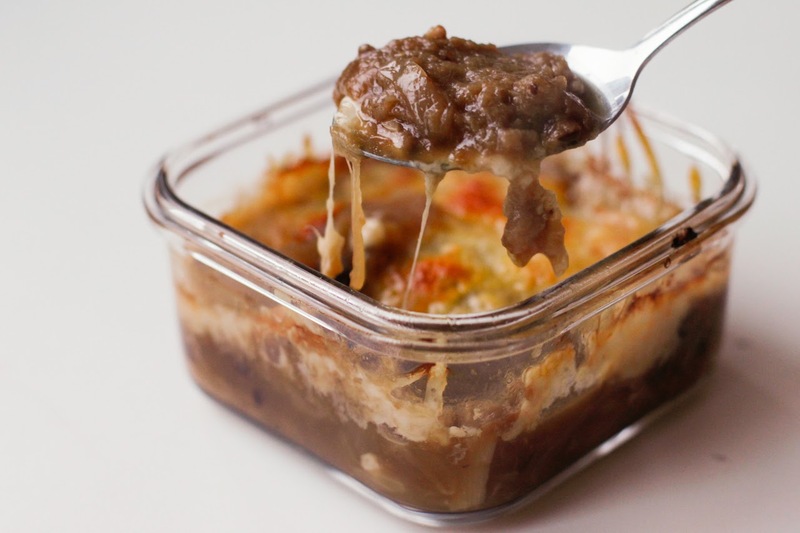 As this is one of your dad's most favorite things, I promise to go with this recipe start to finish. You have schooled me in the ways of homemade stock. I'm a believer. I KNOW this soup must've been amazing.